With practice officially starting this week and the season underway in less then a month, sfctoday.com sat down with new Men’s Basketball Head Coach Glenn Braica to talk about his expectations for the season. “The goal is to win the first game and then worry about the next one after that,“ said Braica, (left) who in the past had a stint as the Assistant Coach at St. Francis. Braica began his coaching career at New York City Tech as an assistant in 1988 and then served as a teacher at The Reece School and worked at the New York City Board of Education from 1989 though 1994. Then he started working at St. Francis College under Head Coach Ron Ganulin, one of the most successful Head Coaches in St. Francis Men’s Basketball history. Ganulin also spent 2005-06 as the Director of Player Development for the NBA’s Washington Wizards before serving two years as an assistant coach at Manhattan College, and was also an assistant with the 1990 UNLV national championship squad. In his previous role at St. Francis, Braica was in charge of player recruiting, scouting, film exchange and player’s responsibilities on and off the court. Together, Ganulin and Braica had some of the most successful years in the school’s history, with a high powered offense and strong defense. 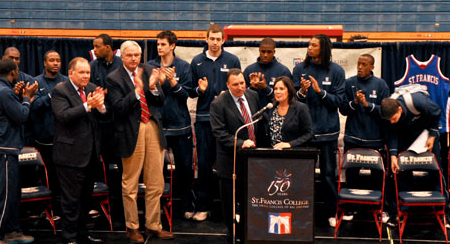 The success at St. Francis led to his college teammate, Norm Roberts, making Braica his first hire after he was named the Head Coach at St. Johns in 2004. Having coached in the Big East, one of the toughest conferences in the country, is tremendous experience to bring back into the Northeast Conference. During Braica’s last seven years at St. Francis, the Terriers posted a 118-83 record, including an 88-42 mark in the NEC. They finished with a .500 or better record in the league seven straight years, at that time the longest active streak in the league. They also reached the NEC semi-finals five times and had two championship game appearances in Braica’s last five seasons. One of the games was still clear in his mind. The Terriers played Monmouth in the Conference Championship game and had a 20 point lead going into halftime. The second half was where things took an unexpected turn. The Terriers had a bunch of technical fouls and questionable calls that went against them and they went on to lose the game. “It was a tough game, and an even tougher loss,” Braica said. That is the closest the school has ever come to making it into the NCAA Tournament. Those around the basketball program can sense the new attitude Braica has brought in. Born and raised in Brooklyn, Braica attended St. Vincent DePaul elementary school. He had a love for basketball and playing as a kid for as long as he can remember. Braica attended St. Agnes High School for his first two years and finished his last two years at Bishop Ford in Brooklyn. He played mostly the point and the two guard and when it came to deciding where to play college ball, he said that it wasn’t much of a decision. Queens College was the place for him and he went on to join Norm Roberts there from 1984-1988. That is where the two met and became extremely good friends. After his playing career at Queens College was over, he said that he knew coaching was something he wanted to get into immediately.